Rated 4.0 out of 5.0 based on 404 surveys. Across from the Yacht & Beach Club Resorts, the BoardWalk Inn is another of the Walt Disney World Deluxe resorts. The complex is a detailed replica of an early-20th-century Atlantic coast BoardWalk. Facades of hotels, diners, and shops create an inviting and exciting waterfront skyline. In reality, the BoardWalk Inn & Villas are a single integrated structure behind the facades. Restaurants and shops occupy the BoardWalk level, while accommodations rise up to six stories above. Painted bright red and yellow along with weathered pastel greens and blues, the BoardWalk resorts are the only Disney hotels that use neon signage as architectural detail. The complex shares a pool with an old-fashioned amusement park theme (there are also two quiet pools). The inn and villas are well staffed and offer excellent service. They’re also home to some of Disney World’s better restaurants and shops, including the BoardWalk Bakery, serving lunch sandwiches and salads along with morning pastries and coffee. The complex is within walking distance of Epcot and is connected to other destinations by bus and boat. Walking time to transportation loading areas from the most remote rooms is 5–6 minutes. We were surprised that so relatively few rooms at the BoardWalk Inn have interesting views. We were in a group staying there before a Disney cruise, and the one couple who actually had a view of the BoardWalk said it was noisy. The transportation by bus (to Animal Kingdom and Magic Kingdom) was the worst. We waited at least 40 minutes every time and almost missed a dinner reservation (for which we had left 1½ hours early). The unique feature that separates BoardWalk from other resorts is the attached BoardWalk shopping and dining district. It contains a number of unique restaurants and lounges. Also, being able to walk or ride a boat to Epcot is a huge advantage. A security gate guards the entrance to BoardWalk's grounds. If you arrive by car, you'll need to provide photo id at the gate; it's not necessary to provide your reservation number or paperwork. A dedicated parking lot across from the lobby serves as temporary parking for those who need it while checking in. Check-in time at BoardWalk Villas is 4:00 pm, and check-out time is 11:00 am. BoardWalk participates in Disney's online check-in program, which allows you to you provide name, address, and credit card information up to 60 days before your arrival. If you've done this, look for an online check-in sign near the registration desk. You'll be routed to one of the online check-in staff and should be on the way to your room in a few minutes. If you've not registered online, look for signs pointing you to the registration/check-in area. You'll need to provide a government-issued photo id and credit/debit card when you register. While parents are completing the paperwork, kids can unwind in a nearby play area decorated with child-sized furniture, and a television showing classic Disney animated films. Disney's BoardWalk's registration staff can provide MagicBands for your stay, if you don't already have them. Get theme park tickets and dining reservations at the concierge desk, to the right of the registration desk. If you need to check in and obtain theme park tickets, you can save some time in line if one adult gets in line for tickets just after another adult starts the registration process. The concierge desk can also make Disney dining reservations, and you can avoid a wait there by making them online prior to arrival. The 532 BoardWalk Villas are decorated in similar pastels—lots of light green, pink, and blue—with bright tiles in the kitchens and bathrooms. Villas range from 412 to 2,491 square feet (studio through three-bedroom) and sleep 4–12 people. Many villas have full kitchens, laundry rooms, and whirlpool tubs. the villas tend to be more expensive than similar accommodations at other Disney resorts—you pay for the address. BoardWalk Studios: Studios sleep up to five people and include one queen-size bed, one double sleeper sofa, and one small fold-down bed suitable for a child or small adult. BoardWalk studios are 412 square feet. BoardWalk One-Bedroom Villa: The 1-bedroom villa sleeps 4 and provides a formal kitchen, a second bathroom and a living room in addition to the studio bedroom. The living room's sofa folds out to provide beds for 2 more people. 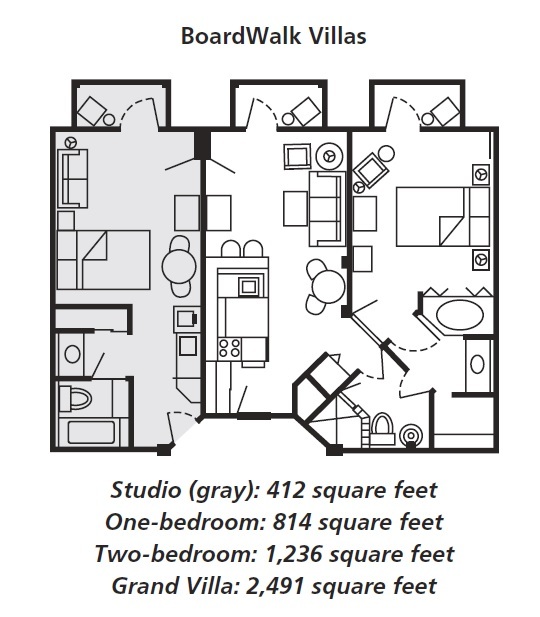 BoardWalk one-bedroom villas are 814 square feet. 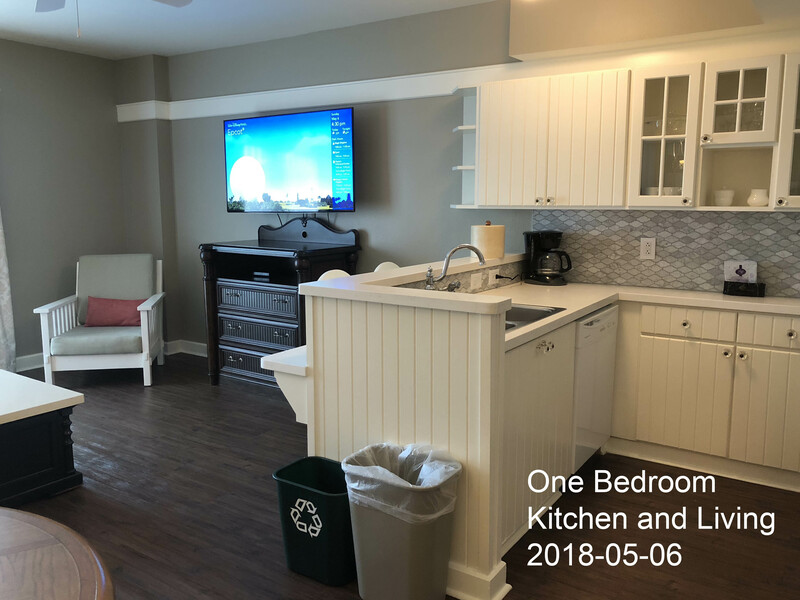 Take advantage of the full sized refrigerator and freezer in your 1- 2- or 3-BR villa's kitchen and pick up some ice cream to go from Ample Hills for a late night snack. Or breakfast. No one is judging. 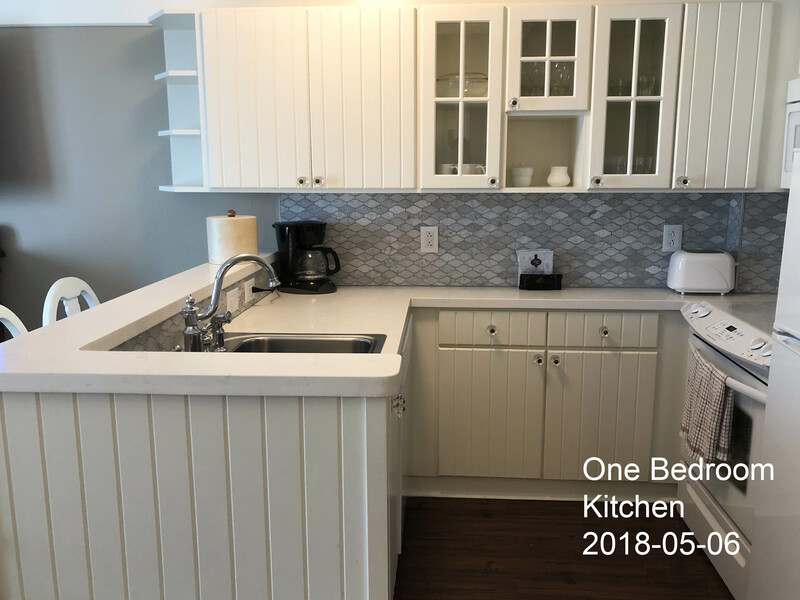 BoardWalk Two-Bedroom Villas: Two-bedroom villas sleep nine and include all of the kitchen amenities found in a one-bedroom, plus an extra bathroom. 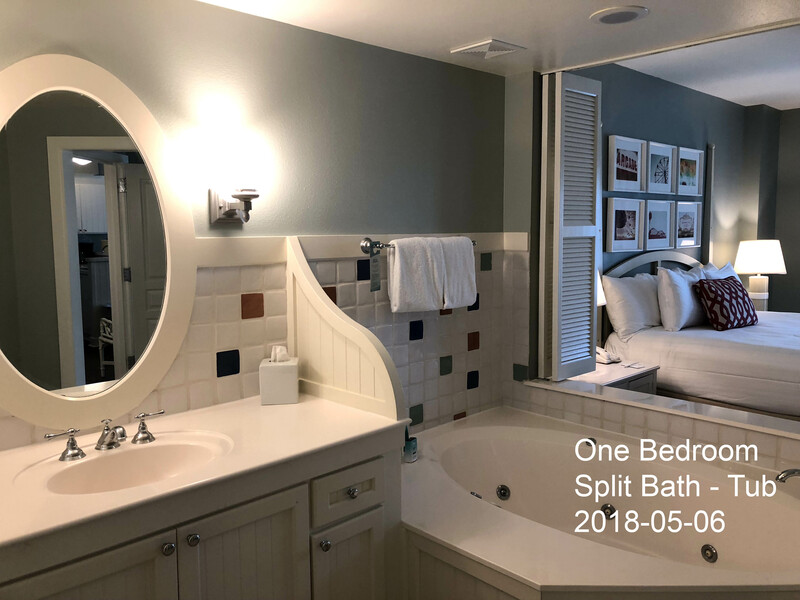 One of the baths is attached to a second bedroom with two queen beds or a queen bed plus a sleeper-sized sofa. As with the one-bedrooms, a sofa bed and sleeper chair in the living room provide extra places to snooze, though they're best suited to small children. Bathrooms in the two-bedroom villas are laid out a bit better than those in the one-bedrooms, with more room to move about. BoardWalk two-bedroom villas are 1,236 square feet. 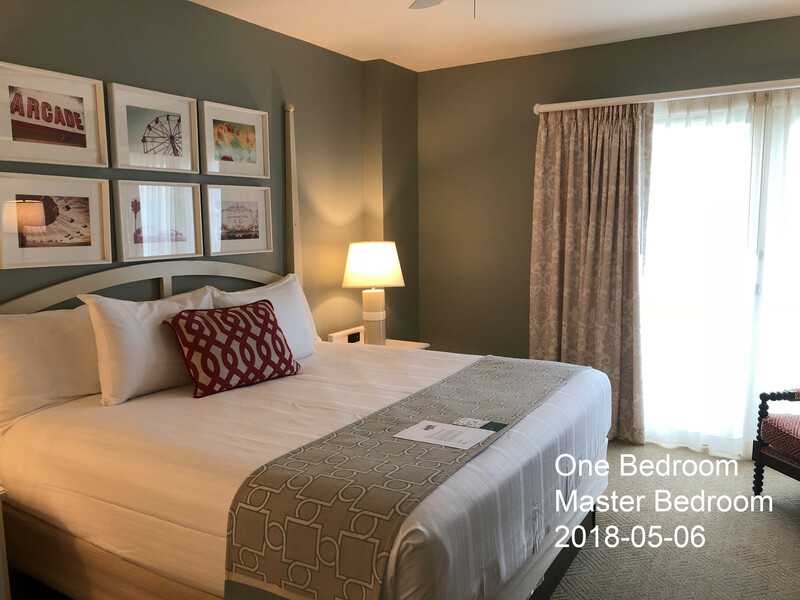 BoardWalk Grand Villas: The two-story grand villas sleep 12 and include four bathrooms, the same master-bedroom layout, and two bedrooms with two queen beds apiece. An upstairs seating area overlooking the main floor provides a sleeper sofa and chair. BoardWalk grand villas are 2,491 square feet. 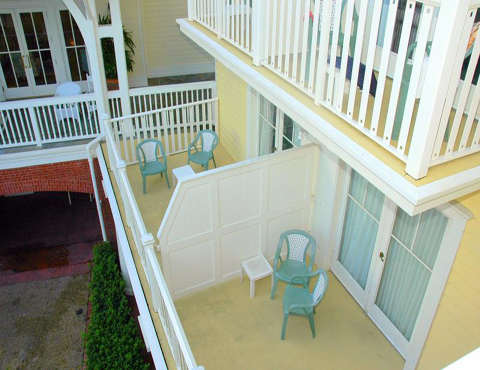 Disney's BoardWalk Inn resort has around 27 handicap-accessible rooms. Some feature roll-in showers, while others include assistive hearing devices. 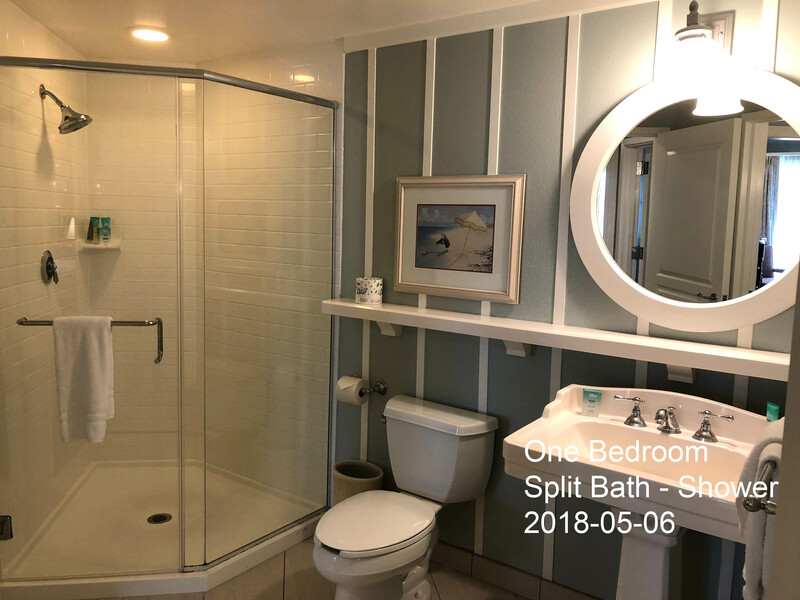 A subset of these rooms have been converted to comply with Florida's Accessibility Code, with changes to everything from bed, counter-top, and dresser drawer height, to door widths, wheelchair ramps, and more. Use our Hotel Room Finder to see which rooms have which feature. Disney knows that some hotel rooms are better than others. Most people want something pretty to look at from their hotel room window. To capitalize on this, Disney categorizes all of BoardWalk Inn's hotel rooms based on what you see from inside the room. 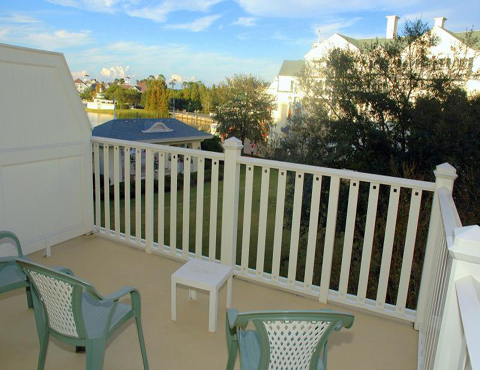 BoardWalk View: A small number of rooms at BoardWalk Villas overlook the actual BoardWalk. 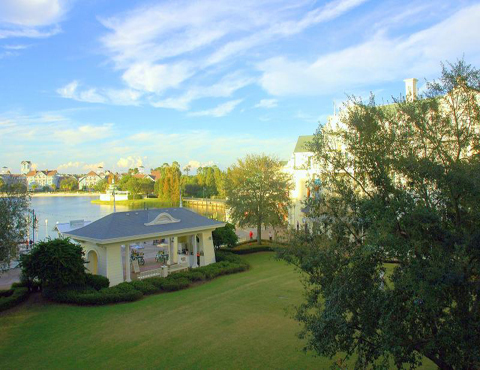 Some rooms in BoardWalk Villas have a view of crescent lake. Rooms 5001-5033 afford dynamic views of the promenade and crescent lake, with Epcot in the background. Garden or Pool View: Garden views can include views of landscaping and trees, some rooms look out on to one of the resort's pools. Standard View: Standard rooms generally have unremarkable views of landscaping or parking lots. the view from your window for the most part includes landscaping and trees. BoardWalk Inn has three pools. The largest, Luna Park pool, sits in the BoardWalk Villas section of the resort near the the lobby. There is also a hot tub, kiddie pool and water player area. The other smaller pool is located at the far east side of the resort wing of the resort. This pool is also a basic concrete pool and is considered a "quiet pool," meaning that loud play and splashing around are discouraged. the final quiet pool is located near the southern tip of the BoardWalk Villas building. BoardWalk's pools range in depth from around 3 feet 6 inches/1.1m to 4 feet 9 inches/1.4m. Pools are open every day, including during winter. The pools are heated to 82°F/28°C throughout the year. we've swum in temperatures as cold as 40°f/4°c; the water was fine, but getting out was a shock. BoardWalk also has a hot tub located near Luna Park pool. Luna Park pool has one water slide that all ages are free to use. Guests can find showers, storage lockers, restrooms, and laundry facilities. Pool hours are at least 9 AM to 8 PM, extending to as much as 7 AM to 11 PM during busy times. Pools will have lifeguards during the pools' operating hours. Pool toys are permitted in BoardWalk's pools, including "pool noodles," and basic toys that would be appropriate for water use such as rubber duckies and bucket & shovel sets. Some of us will occasionally bring something like a whiffle ball for playing catch in the pool. As long as you’re not disturbing other guests, you’ll be fine. Also note that kids with pool toys become very popular with other kids in the pool who want to play too. If you’re traveling with an only child and want him to have some age cohort interaction during your vacation, a nice strategy is to bring some extra toys. Chances are he’ll make a buddy. BoardWalk's Luna Park pool has a chair-lift device that can lower guests in wheelchairs into the shallow end of the pool. Check with any lifeguard for assistance on using the lift. a small playground set is located near Luna Park pool. The set has a small plastic slide and a couple of sections with a few steps for toddlers to go up and down. Safety seems to be Disney's concern here - there are no swings, and the entire area is covered in a springy, poured rubber surface. The BoardWalk area of the BoardWalk resort has a large variety of restaurants and lounges. BoardWalk bakery, BoardWalk joe's, BoardWalk Pizza window, BoardWalk To Go and Ample Hills Creamery are all counter service restaurants for those looking for something quick. If you're looking to sit down and have a meal there's Big River Grille & Brewing Works, ESPN Club, and Flying Fish Cafe. Flying Fish has a contemporary setting inspired by a 1930s Coney Island roller coaster (The coaster was actually called The Flying Turns, and one of the cars on the ride was dubbed the Flying Fish). Booth backs resemble the climbs and swoops of a coaster. On the far wall is a stylized depiction of ferris wheel, and whimsical fish fly overhead on a parachute ride. Diners may choose to sit at the counter that overlooks the bar or the open kitchen. Locals love the Flying Fish Cafe, and for good reason. Though this is food for grown-ups, you'll often see children in the noisy dining room because of the BoardWalk location (their menu includes fish of the day and a grilled steak). If you can't get a table, check on seating availability at the counter - Chef Keating also has a special menu at the "chef's counter," but you have to book that in advance. Chef Tim Keating, a repeat James Beard Foundation finalist, is a big proponent of Florida products, from seafood to meats, fruits, and vegetables. The fare here changes frequently, but you'll always find the potato-wrapped snapper, the restaurant's signature dish, served with creamy leek fondue and a red wine-butter sauce; char-crusted New York strip steak; and the lump crab cakes. Desserts are seasonal, but the house-made sorbets and caramelized- banana napoleon are divine. For a special experience, you can book the chef's tasting wine dinner. Sitting at the chef's counter, you can watch the chef create the six courses for your meal. Each course is paired with a wine that is selected by the manager. This experience is designed for ages 14 and up, and you must make reservations at least one day in advance. The big dining room feels a little more personal, with three different “dining areas” and a private room at the back and an open kitchen for watching the action, including a wood-burning oven. Our favorite spot is the “formal dining room” right in front of the kitchen, where it’s a little less noisy (and carpeted), or one of the booths at the back. Servers tend to be a little overattentive. There’s also a quickservice window streetside to soothe the urgent pizza craving. The kitchen is doing things right—making mozzarella and ciabatta daily, rolling out fresh pasta (cavatelli), slicing cured meats with a beautiful Italian flywheel. The wine list is carefully curated, with labels from all of Italy’s major regions and more than 30 available by the glass or quartino. Breakfast is one of the best on Disney property. Beginning in spring 2017, Trattoria Al Forno will offer a character breakfast featuring "royal couples" such as Rapunzel & Flynn Rider and Ariel & Prince Eric. A sports bar to the nth degree, with basketball-court flooring, sports memorabilia, and more television monitors than a network affiliate. The bar area has satellite sports-trivia video games. A large octagonal room with a wall of TVs serves as the main dining room. ESPN Club is family-friendly and one of the cheapest dining spots on the BoardWalk. Service is a little more brusque than at other Disney restaurants. Portions are large, and the quality is in line with the price. A good choice for late-night dining or when you have to choose between going out for a bite and staying in the room to catch the big game. Run by a Tennessee company, Big River Grille seems like an afterthought along the BoardWalk and competes with nearby ESPN Club for the burger-and-brew crowd. But if you're looking for handcrafted beers, this is the place - they serve five beers, including a light lager, a robust ale, and seasonal choices. A good late-night dining choice. Industrial cubist murals of factories, machinist-metal and wood chairs and tables, and a midnight-blue neon river that flows along the ceiling of the restaurant set a working-class atmosphere. The place is small - it seems like the huge copper brewing tanks take up more room than that allotted to the diners. Outside seating and service is available, weather permitting. BoardWalk Bakery is small counter service restaurant with a limited menu. The menu is made up of sandwiches, salads, and a selection of pastries. During breakfast hours BoardWalk Bakery sells a popular bread bowl filled with scrambled eggs and potatoes. BoardWalk Joe's is a counter with a small selection of margaritas. You can also grab a pretzel or a bag of roasted almonds for a snack. BoardWalk Pizza window sells whole pizzas or by the slice. BoardWalk To Go sells hot dogs, corn dogs, ravioli, mozzarella sticks, chicken, meatball sub, nachos, fries, onion rings, beverages. Grab a footlong corn dog, you won't be sorry... actually your stomach may be sorry. BoardWalk Bakery, BoardWalk Joe’s, and BoardWalk Pizza Window participate in Disney's Rapid Fill refillable mug program, where you purchase a souvenir plastic mug once, and get free refills for the remainder of your stay. The cost is a flat $17.99 for your length of stay. The break-even point for the refillable mug program seems to be around 3 visits on the 1-day plan; 4 visits on the 2-day plan; 5 on the 3- day plan; and 6 visits for stays of 4 or more days. Keep in mind that if you buy a regular $3 fountain soda at any meal, you get unlimited refills during that meal. So for the refillable mug program to make sense, you'll need to drink soda with at least 3 separate meals on the 1-day plan, or 5 separate meals on the 2-day plan. In those cases, it would be hard to get too far from a bathroom, let alone all the way to the parks. Restaurants at BoardWalk participate in the Disney Dining Plan; meals cost 2 credits at Flying Fish and 1 credit other restaurants. Tables in Wonderland cardholders are eligible for a 20% discount at most resort restaurants. BoardWalk has one lounge and two pool bars to consume adult beverages at. Belle Vue Lounge is BoardWalk Inn's main lounge. Belle Vue Lounge has indoor seating and a full drink menu with several beer selections, wines, and a selection of spirits. The lounge is usually open 4 pm to 12 am daily. Leaping Horse Libations is located adjacent to the Luna Park pool. Leaping Horse Libations has a small selection of specialty drinks, beer and wine, as well as limited grab-and-go dining options. Driving your own car Disney's BoardWalk Inn resort is just off of i-4 in Lake Buena Vista. Take i-4 exit 67 - Epcot Center Dr.. Take Buena Vista Dr for about 1.2 miles to Epcot Resorts Blvd. Turn right on Epcot Resorts Blvd and BoardWalk Inn will be on your left. From Sanford International Airport it's about a 40-minute drive from Sanford to Disney's BoardWalk Inn resort. If you're not renting a car, be aware that Sanford's airport offers fewer transportation options than Orlando's, and Sanford's options are generally much more expensive. A taxi from Sanford International Airport to Disney's BoardWalk Inn resort will cost between $120 and $150, depending on traffic. Mears Transportation offers 3-passenger towncar service to Disney's BoardWalk Inn resort for around $140 each way, plus tip; 5-passenger SUV service or 10- passenger van is around $190 each way. That means round-trip transportation will run you somewhere between $240 and $380, plus tip, between Sanford and Disney's BoardWalk Inn resort. At those prices, it may be less expensive to rent a car and park it at the hotel. Getting to the theme parks, water parks and Disney Springs Disney provides free bus service from Disney's BoardWalk Inn resort to Magic Kingdom, Disney's Hollywood Studios, Epcot, Disney's Animal Kingdom, Blizzard Beach, Typhoon Lagoon, and Disney Springs. Disney's BoardWalk Inn resort's bus stops sit along the front wall of the lobby, between the lobby and check-in parking lot. Each theme park has its own bus stop somewhere along the wall. Animal Kingdom's bus service is shared with Blizzard Beach, while Disney Springs and Typhoon Lagoon also share a stop and service. 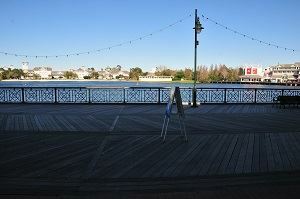 Epcot and Disney's Hollywood Studios can also be accessed by boat from the dock near on the BoardWalk. Boat service may be suspended during thunderstorms, so if it's raining or looks like it's about to, Disney will provide buses. Ask a Disney Cast Member about BoardWalk Inn's bus schedule, and they'll tell you that buses run about every 20 minutes. In reality, BoardWalk Inn's bus schedule varies considerably depending on the time of day and where you're headed. For example, if you're headed to the Magic Kingdom between 8 am and 11 am, you'll wait around 12 minutes, on average, for a bus to arrive. The bus schedules for Epcot, Animal Kingdom, and Disney's Hollywood Studios are about the same early in the day, with a bus arriving every 10-15 minutes, on average. Bus schedules to the water parks and Disney Springs are a little less frequent, and you could wait anywhere from 20 to 40 minutes for a ride. If you've got your own car, it's faster to drive yourself to Typhoon Lagoon and Blizzard Beach water parks, and Disney Springs. Disney's bus service is faster to the Magic Kingdom, Epcot, Disney's Animal Kingdom, and Disney's Hollywood Studios. We evaluate Disney's BoardWalk Inn resort's bus service annually, and the latest transportation times can be found below. Getting to another hotel from Disney's BoardWalk Inn Resort If you've got dining plans at another Disney hotel, the cheapest option is to take a Disney bus from Disney's BoardWalk Inn resort to Disney Springs (or an open theme park), then take another bus from there to your destination hotel. 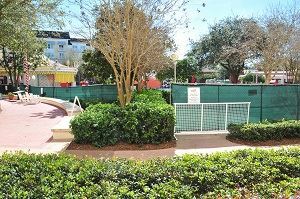 Do the reverse to get back to Disney's BoardWalk Inn resort. While that's free, it can take anywhere from 90 minutes to 2 hours each way. If your destination is one of the Magic Kingdom monorail resorts, and the Magic Kingdom is still open, you could take a bus to the Magic Kingdom, then either walk (to the Contemporary and Bay Lake Tower), hop on the monorail (to the Polynesian and Grand Floridian), or take a boat (to Fort Wilderness, the Polynesian, and the Grand Floridian). We suggest you still allow at least an hour for that. The fastest option, however, is almost always a taxi from BoardWalk Inn to wherever you're going; it's generally not more than a $20, 15-minute cab ride to get to most Disney hotels from BoardWalk Inn, and often less. Taxis are available outside the lobby; if a taxi is not already sitting out front, the bell services desk also serves as a taxi stand, and they'll call one for you. You can also take a boat in Crescent Lake to Disney's BoardWalk Resort or the Swan & Dolphin hotels. This option can also take some time depending on where you are going and how frequent the boats are running. Muscles & Bustles Health Club is BoardWalk's fitness center. It is open 24 hours a day but attendants are only available from 6:00 am to 9:00 pm. BoardWalk's main gift shop is Screen Door General Store. It is located on the BoardWalk near the boat dock. As you'd expect from a Disney gift shop, it has a decent collection of souvenirs ranging from small trinkets such as keychains and pens, to embroidered jackets and Disney princess dresses. Prices for these items are about what you'd pay in the theme parks or Disney Springs. Screen Door General Store also sells basic pharmacy items such as sunscreen, aspirin, allergy and cold medicine, baby diapers and formula, shampoo, and the like. Screen Door General Store has Disney-branded cookies, chocolate, coffee tins, and similar items, if that's what you're looking for. Prices for these items are considerably higher - about double - than what you'd probably pay at home. Located next to Muscles & Bustles Health Club is the Slide Show Games Arcade, which has a decent collection of relatively recent video and arcade games. Most games cost $0.50 to $2.00 per play, which can add up quickly. It's helpful to set a budget with your kids before they go in. Walkers, joggers and runners can find a jogging trail at Disney's BoardWalk Inn Resort. 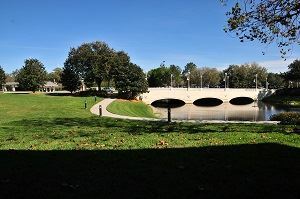 Tt is a scenic 0.8-mile course around around Crescent Lake. Thanks to bridges over Cresent Lake guests are able to make a full circle while passing by the Yacht & Beach Club and the Swan & Dolphin resorts. Every Monday and Wednesday, Yoga is available 8:15 to 8:45 AM at Village Green. Participation is free but limited to the first 20 Guests. Mats and towels are provided. 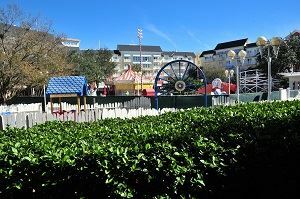 Disney doesn't offer on-site child care at BoardWalk, but you've got some options. If you've got a car and you're headed to the theme parks, you can drop off your little ones at one of the child-care clubs at a resort nearby. Services vary, but children generally can be left between 4:30 pm and midnight. Milk and cookies and blankets and pillows are provided at all centers, and dinner is provided at most.Pplay is supervised but not organized, and toys, videos, and games are plentiful. 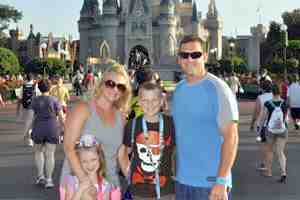 Guests at any Disney resort or campground may use the services. The most elaborate of the child-care centers (variously called "clubs" or "camps") is Lilo's Playhouse at the Polynesian Resort. the rate for ages 3-12 is $15 per hour, per child (2-hour minimum). All the clubs accept reservations (some six months in advance!) with a credit card guarantee. Call the club directly, or reserve through Disney at 407-WDW-DINE. (If you call before 4 pm, call the club directly using the number shown below.) Most clubs require a 24-hour cancellation notice and levy a hefty penalty of 2 hours' time or $22.50 per call for no- shows. a limited number of walk-ins are usually accepted on a first-come, first-served basis. 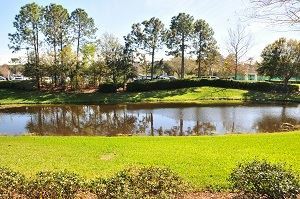 Two companies provide in-room sitting in walt Disney world and surrounding areas. They're Kid's Nite Out and Fairy Godmothers (no kidding). Both provide sitters older than age 18 who are insured, bonded, screened, reference-checked, police-checked, and trained in CPR. In addition to caring for your kids in your room, the sitters will, if you direct (and pay), take your children to the theme parks or other venues. Neither service will transport your children in private vehicles or give baths. Both offer bilingual sitters. Washers and dryers are in laundry facilities located near the third floor elevators. Cost is $3 per wash, and another $3 per dry cycle. The machines take credit cards. A small selection of soap, fabric softener, and dryer sheets are also sold, for around $1 each. A typical wash cycle takes 20 to 30 minutes, and a typical dry cycle takes 40 to 50. Laundry room cards can be purchased for $7 (using cash or credit) at the hotel's front desk. These cards get you one wash and one dry cycle, plus text messages letting you know when your laundry has been completed. Walt Disney world laundry rooms now make use of a technology called "laundryview" which displays washer and dryer availability on their website. If you lose something during your stay, contact Disney's BoardWalk Resort's Lost and Found department by calling (407) 939-6200. Guests over 21 can enjoy Jellyrolls, a bar with dueling pianos and audience sing-alongs. The stage is raised and has large mirrors behind the performers and a lightshow happens as the pianists take turns playing and engaging the audience. This location is very popular so it is recommended that you show up early if you want a table. Guests 21 and over who enjoy dancing should check out the Atlantic Dance Hall, which is nightclub that plays songs from the '80s, '90s and today. Atlantic Dance Hall's hours depend on the season but they are usually open 9:00 pm to 1:45 am. 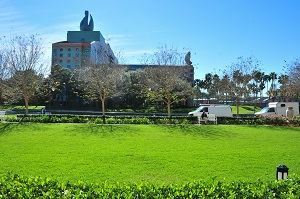 TouringPlans offers pictures of the view from any Disney resort room on property. 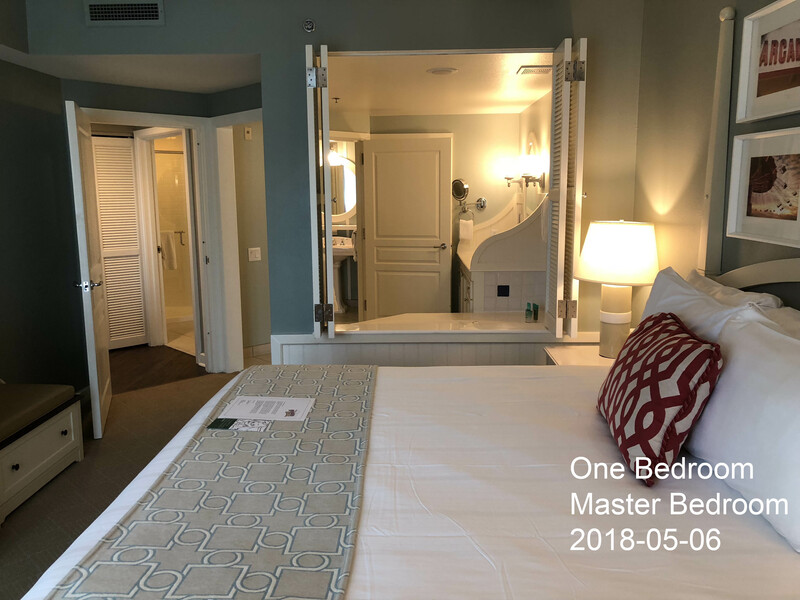 Click here for the Disney's BoardWalk Villas map and to choose a room to see the view. 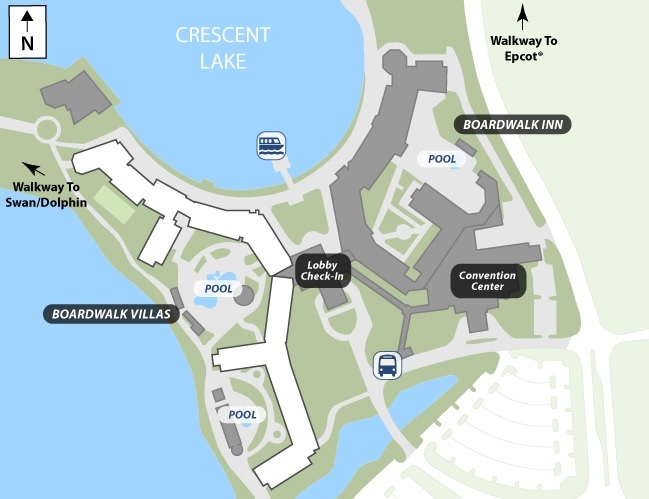 The complex comprises several wings that radiate from the lobby complex, roughly in the shape of a giant H. Crescent Lake and the Promenade (pedestrian boardwalk) are to the north, the entrance is to the south, and the canal that runs to Disney's Hollywood Studios is to the west. Room 1121: A villa facing southeast overlooking a canal. Room 1127: A standard view room facing a parking lot. Most Villas overlook a canal to the west with the Swan resort and its access road and parking lots on the far side. Worse are the rooms that front BoardWalk’s entrance and car lots. As at the inn, the villas offer only a handful of rooms with good views. Odd-numbered rooms 3001–3047, 4001–4047, and 5001– 5047 afford dynamic views of the Promenade and Crescent Lake, with Epcot in the background. Rooms X05, X07, X13, X15, X29, and X31 are studios. They’re a little noisy if you open your balcony door but otherwise offer a glimpse of one of Disney World’s more happening places. Unless you bag one of these rooms, however, you’ll spend a bundle for a very average (or worse) view. Room 1001: Great view of the Boardwalk, Beach Club, and Epcot's Spaceship Earth. Room 1004: Garden View room with the Swan resort in the background. Promenade-facing villa rooms have noise issues identical to their inn counterparts. The midsection of the canal-facing villas look out on Luna Park Pool, a carnival-themed family-pool complex that gets extremely noisy during the day. Some of the quieter villas are away from the Promenade with views of the canal and a partially enclosed quiet pool. Noise is practically nonexistent; the only downside is that the rooms are relatively distant from the Promenade and Epcot. Rooms on the opposite side of this wing are almost as quiet, but they face BoardWalk’s parking lot and thus are less desirable. Room 1046: Looking out on to the Luna Park Pool. Room 1026: This is the room for you if you want a view of Luna Park Pool's giant scary clown. Rated 4.0 out of 5.0 based on 404 reader ratings.